Are you confident that your love will endure through all tests of time? Why not express it with a ring that has staying power? 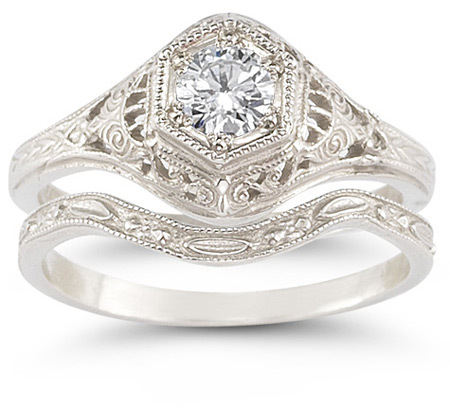 Vintage wedding rings use the styles of the past to communicate a love that will never grow old. As the speed of life increases, designs that call to mind a simpler time can serve as reminders of what really matters. Victorian-inspired looks conjure up images of a period when romanticism reigned and beauty was enjoyed. Read more. All wedding bands communicate endless love, but time-honored designs place extra emphasis on the enduring nature of commitment and affection in a marriage. Vintage styles only get better with time and age only makes them more beautiful. In the same way, love grows as the years pass, becoming greater and stronger. Hand-carved vintage bands display the exceptional care and craftsmanship that can only result from a personal touch. The quality that was valued a century ago is embraced by Apples of Gold and is gorgeously expressed through their collection of vintage wedding rings. 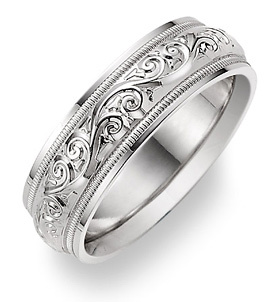 Paisley patterns appear on many popular vintage wedding rings, in styles ranging from demure engraved motifs to three-dimensional swirls. These designs, which first made an appearance in India over a thousand years ago, were popular in the Victorian Era, and to this day they continue to capture eyes and imaginations. Choose a ring that features these curling designs on their own or one that combines paisley with feminine floral designs for a style that�s both lively and ladylike. 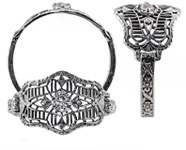 For a look that�s both weightless and substantial, consider a band that utilizes filigree. This delicate form of metal work has been used from France to India to create curving, details designs that have never fallen out of fashion. Or, consider a style personalized with your names for a ring that speaks of the love that�s yours and yours alone. In addition to white gold and yellow gold, a number of Apples of Gold�s vintage wedding rings are available in rose gold, providing a warm yet soft glow that seems to have been made for Victorian-inspired rings. Or, choose a platinum band that complements the fine craftsmanship of these designs with a white, bright color, or one of several sterling silver options for a look that�s both beautiful and affordable. If you know that your love will never expire, consider one of Apples of Gold�s vintage wedding rings. These styles will only get better.